Raise your hand if you love to do all the fall things every October and November? 🙋 After discussing how this season always seems to get away from us each year, a friend of mine (hi, Kristen!) had the genius idea to create a spreadsheet and Google Calendar of all the fall activities we planned to do, and - here's the kicker - actually go out and do them. I know. It's a wild notion to make a plan and then stick to it but we're gonna try our damnedest! A little over a week in, and so far, so good. We've watched a scary film, we've hiked, we've art festival-ed, we've volunteered for the midterm elections (speaking of, make sure you're registered to vote here and then GO VOTE! ), and we have plans for outdoor Nightmare Before Christmas-watching this weekend. We are really taking autumn by the reigns this year! 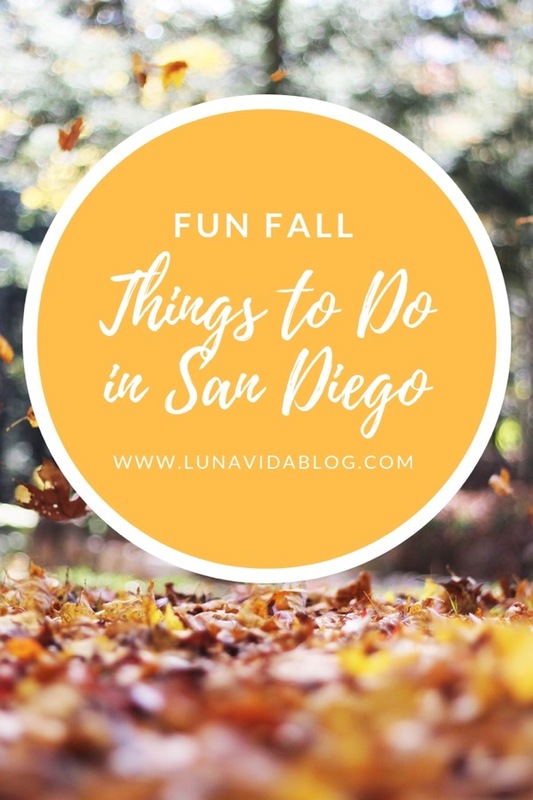 Thankfully SoCal has plenty to offer us fall lovers so I thought if you're local, this list we've created may also be of benefit to you. Hope to see you out and about in this beautiful city of ours! San Diego has some of the best year-round weather known to humankind. It may not be chilly during the days here just yet but at night the temps drop. It's a perfect opportunity to grab a warm drink, a blanket, and catch a free Halloween-themed movie at the park! Of course. This is a necessity no matter where you live. Here is a list of local SD County spots! We are headed up there at the end of this month in time for their Halloween festivities. They offer family-friendly fun during the day and spooky stuff after sunset, so there's something for everyone! San Diego has some very famous haunted spots. If you're feeling brave and looking for some paranormal activity, schedule a walking tour! I've discussed my love of this tiny town before (read about it here). Somehow though, I've never gone to an orchard there - and they're famous for apples! This is a must do this autumn.